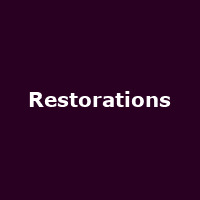 Restorations are an American rock band from Philadelphia, formed in 2010. The band features founder members, guitarist and singer Jon Loudon, Dave Klyman - guitar, and Jeff Meyers - drums, plus Dan Zimmerman - bass and Ben Pierce - keys/ guitar/ vocals. They released their debut album, "Restorations" in 2011, followed by: "LP2" (2013), "LP3" (2014), plus 2018's: "LP5000".